The challenges faced by thermal engineers tasked with cooling rugged electronics are often extensive. This blog post is meant to provide an overview of ‘rugged’ standards as well as address some thermal management techniques being used. Electronics for both military, marine and industrial applications are exposed to a variety of harsh conditions from extreme temperatures, wet or dusty environments, and situations where components are subject to repeated shock or exposure to corrosive substances. Thermal engineers designing rugged systems must content with enclosures/chassis that offer little to no airflow and reliability requirements that limit design options. Here are a few of the US standards used to define whether ruggedized devices can stand up to harsh environments. One the oldest and most widely used US standard is a military specification called MIL-810. It’s been used by all Department of Defense agencies since with 1960’s (with numerous revisions) and is regularly adopted by the private sector for use in commercial/industrial applications. One of the advantages of MIL-810 is that test requirements, duration and sequences are clearly defined. There are around thirty test categories ranging from the common like temperature and water resistance to the niche like pyro-shock and acceleration, but equipment is rarely, if ever, designed to pass all of them. The two most often mentioned ‘rugged’ electronics standards for the industrial and commercial markets are NEMA-250 and IP. Issued by the National Electronics Manufacturers Association (NEMA), specification 250 details a protection rating for electronic enclosures which ranges from limiting access to hazardous system components to degrees of protection from dust, water and corrosives. The Ingress Protection Ranking (IP Code) rates devices on the degree of solid particle and liquid protection as well as impact protection. Additionally, several ANSI accredited VITA standards specify environmental requirements for different classes of COTS plug-in modules. While we’ve touched on a few US standards/specifications for harsh environments, it should be noted that that there are many others from the extensive German DIN standards to STANAG standards used by NATO defense forces. Irrespective of the specific ‘rugged’ standard, thermal engineers need to be creative with how heat is managed in electronic devices designed for harsh conditions. 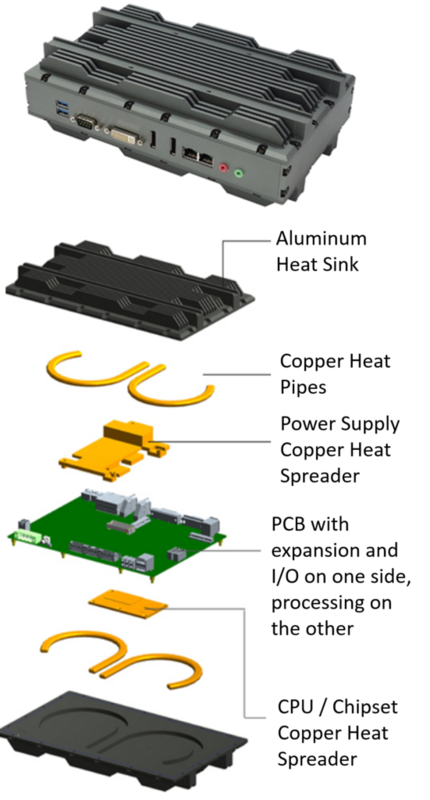 Depending on the required range of operating temperature and level of protection against vibration, shock, dust, sand, and or water rugged electronics chassis and thermal management design can take on many forms. Let’s use a familiar example: a general purpose computer with Intel Core i7 processor and some level of internal expandability. The first is a Comark Enduranode PC certified under IEC-60945 for marine use in a protected environment like the bridge of a ship. 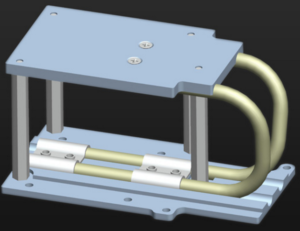 Test requirements/ranges are beyond that of a consumer PC and include Environmental, Safety and Electromagnetic: dry and damp heat, low temperature, vibration to simulate propeller and wave slamming, corrosion resistance, noise levels, limited access to high voltages within the chassis, and improved protection against electromagnetic interference. Figure 1 shows the outside of this unit. It uses the small form factor chassis as a heat sink incorporating an external extruded aluminum fin stack with a corrosion resistant coating. A solid state hard drive was chosen for reliability and resistance to vibration reasons. Additionally, all electronics are conformal coated to protection against moisture, dust, chemicals, and temperature extremes – in this case -20 – +50oC without fan and up to +60oC when the internal system fan is active. The unit is vented on both sides and incorporates an on-demand fan but because I couldn’t find any internal pictures of this unit, I’ll make some assumptions about how heat is being managed. In addition to the already mentioned conformal coating on all electronics, heat generated from the 50 watt combined CPU and chipset could be spread using an aluminum baseplate, possibly with a low profile fin stack directly above it. Copper heat pipes are almost certainly used to transport heat to the finned chassis lid. Figure 2 is a rendering of a heat sink for a different product (Logic GL-L05) with similar dimensions and thermal design, but could be representative of what’s in the Comark computer. Additionally, the power source may have its own fan and/or be a high efficiency version which generates less heat. 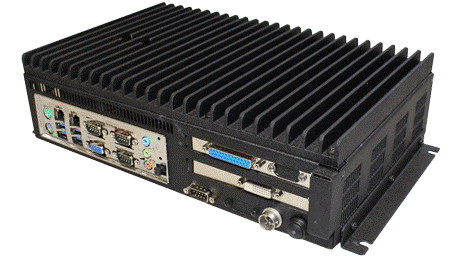 Let’s compare this to a more rugged MIL-810G computer designed to operate in environments from -40oC – +70oC (without CPU throttling) and withstand mechanical shock, temperature shock, and vibration as set forth in the MIL specification. The chassis is fanless and non-vented although not completely sealed due to the I/O ports, however it is tested for dust resistance. The 50 watt combined CPU and chipset are soldered on-board as is the solid state drive for improved shock and vibration capability. While the electronics and power of this system are comparable to the Comark, the PerfecTron SR100 has an external volume roughly half that of the Comark unit. For this example, I won’t have to speculate on the thermal solution as an exploded diagram was available from the PerfecTron website (Figure 3). Residing on the top side of the PCB are I/O functionality and the power source to which a copper heat spreader is attached. The spreader mates to two copper heat pipes embedded into the base of the upper heat sink lid. The CPU and chipset, located on the opposite side, are similarly attached to a copper spreader with heat pipes embedded in a lower heat sink lid. While I’ve chosen rugged designs that both use heat pipes, other options are available to thermal engineers depending on the ambient temperature as well as the size, weight and power goals (SWaP) of the rugged electronic device. Here’s a concise article from Military Embedded Systems Magazine on Airflow Through, Liquid Flow Through & Spray Cooling.